Offering you a complete choice of products which include bradma hydraulic roll marking machine and bradma die hard pneumatic roll marking. Table Rise 10 mm Hydraulically, 110 mm by handwheel. Automatic compensation for variation in work piece diameters. Rigidly fabricated, reinforced steel frame. Can mark round work piece up to 200 mm diameter. Can mark flat work piece up to 170 mm thickness. Open back permits marking of long bars. Serial numbers can be marked with automatic indexing. Can make up to 4 lines of 6 mm characters, or 8 lines of 3mm characters. Ample daylight permits extensive use of fixturing and tooling for almost all shapes and sizes of components. Electrically - controlled hydraulic operations hydraulic cylinders operate table and marking die slide. Table pressure controls depth of mark ensuring uniform depth. One master foot-pedal control for operating table and die slide cylinders in proper sequence. Specially designed cylinder fitted with hardened bearing. Die slide moves on hardened plate with rollers for precision and long life. Components that can be marked Shock Absorbers, Flanges, Elbows, Bends, Mortar Barrels, Gears, Fuses, Pistons, Couplings, Railroad Bearings, Shells, Axles, Propeller Shafts, Rock Drills, Magneto, Lock Body. Daylight can be increased to 425 mm. Stroke can be increased 250 mm. Marking capacity can be increased to 8 lines of 6 mm characters. Can mark round work piece upto 140 mm dia. All - pneumatic operations air cylinders operate table and marking die slide - free from electrical connections. 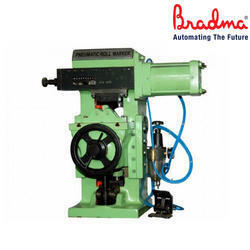 Specially designed cylinder and linkage mechanism, fitted with hardened bearings. Die slide moves on hardened plate with rollers for precision and long life. "Components that can be marked Gears, Engine Valves, Drills, Taps, Bomb Fuses, Bomb Shells, Sockets, Fuel injection Nozzles, Hose End Fitting, Pneumatic Tools, Axles, Propeller Shafts, Pinions, Cylinder Neck Rings, Squares Shank Tools, Bushes, Machines Tool Accessories such as Chucks, Collets, etc." Flat components can be marked using s segmental type holder. 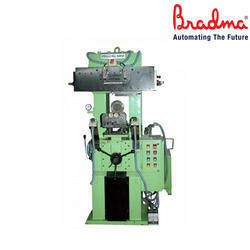 Solid or thick walled cylindrical components can be marked either by using a roller cradle or special fixture." "For Assured Results We Recommend Bradma Diehard Toolings (Interchangeable Steel Types, Stamp Marks and Holders)."